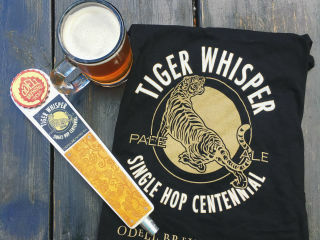 Odell Brewing and the crew from Easy Tiger joined forces in Colorado to brew Tiger Whisper. It’s a limited-edition, single-hopped (Centennial) Pale Ale with an adjunct of ginger. Bonus: When you buy an Odell beer, you can enter to win one of two Odell Greenbelt Survival Packs (includes logo soft-side cooler, blanket, cap, disc golf disc, water bottle, pint glasses & more).